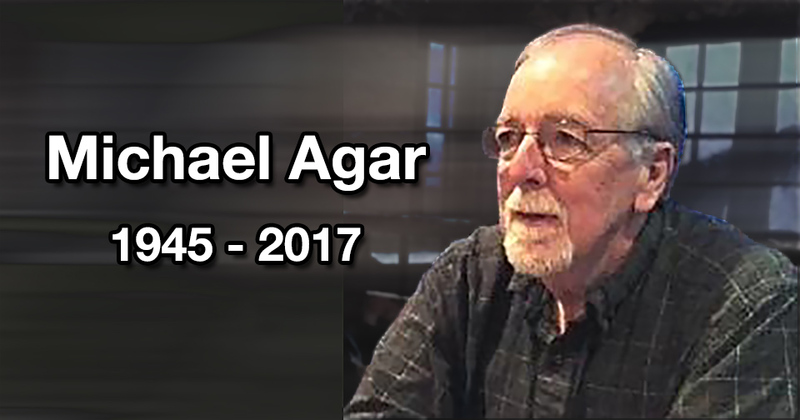 On May 20, 2017, Michael Agar, one of the world’s most famous anthropologist of drugs and founding member of the Alcohol, Drugs, and Tobacco Study Group passed away. Below is a two-part obituary honoring Michael’s life and work. 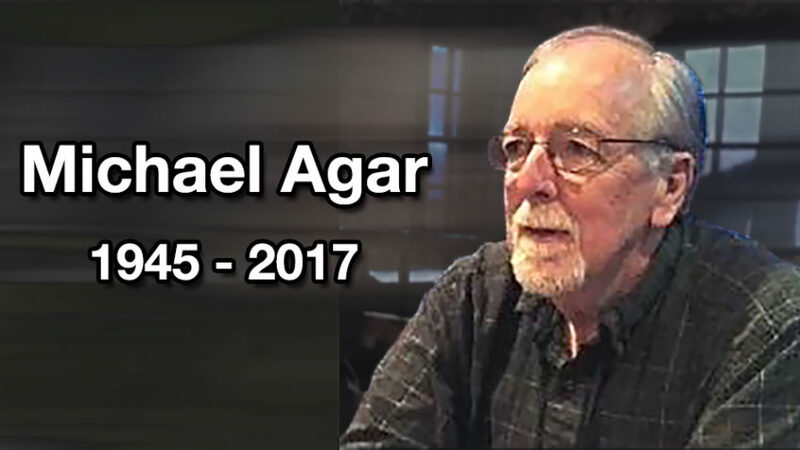 The first part, “The Professional Stranger,” was written by Michael himself, and the second part, “Mike Agar,” was written by fellow ADTSG member Bryan Page​. Michael H. Agar was born in Chicago right around the time of the German surrender at the end of WWII in 1945. After an uneventful childhood of dirt clod wars at housing construction sites and memorized recitations of the Baltimore catechism, he was forcibly relocated to Livermore, California, in 1956, when his father took a job at the new Lawrence Radiation Lab. He always considered it his hometown, strange mix of cowboys and science that it was. Since he was particularly good at multiple-choice tests, he was able to attend Stanford, courtesy of the then abundant – and now endangered – concept of financial aid, graduating with a degree in anthropology in 1967. While there he arranged his own year abroad program with the help of a crypto-anarchist dean and anthropology professor Alan Beals. Mike worked in a small village in South India and then returned to enjoy the shift from beer to marijuana that had occurred in his absence. He had turned into an internationalist – and, therefore, in the eyes of many of his friends’ parents, a communist – with his experiences during high school as an exchange student in Austria and as a fieldworker in South India. Off he went to grad school at the Language Behavior Research Lab at Berkeley, leaving with a PhD in 1971. Life changed with the Vietnam War when he gratefully accepted a commission in the Commissioned Corps of the U.S. Public Health Service during graduate school. Instead of becoming a South Asianist, with the help of his graduate advisor, Paul Kay, he turned into a lifelong drug expert, an ironic career for a 60’s Berkeley student. He taught at several universities, foreign and domestic, the most noteworthy of the foreign gigs being two stints in linguistics at the University of Vienna and several at the Intercultural Management Institute at the Kepler University in Linz. His most extensive domestic position was in the Department of Anthropology at the University of Maryland where he helped develop and run a program to train practitioners, rather than academic researchers. By the mid-90’s he set off on his own as Ethknoworks, and, in fact, will be available as a ghost for a while on the home page ethknoworks.com. He wrote a lot – son of a journalist and a photographer – and considered himself a craftsman who worked with ideas rather than materials. His main reward was when a student came up after a talk and thanked him for help in solving a problem in the student’s own work. His concept of “languaculture,” modified from Friedrich’s original “linguaculture,” had a major impact in applied linguistics, and his article on the crack cocaine epidemic helped change discriminatory drug laws. His first book, Ripping and Running, opened new directions in ethnography and helped start the field of cognitive science. The Professional Stranger served as a resource for many students embarking on their first fieldwork. There were other books – Independents Declared, Speaking of Ethnography, and Dope Double Agent, to name a few. His last was a book called The Lively Science, an attempt to show how human social research was a different kind of science. Mike also left behind a draft manuscript behind called Culture: How to Make It Work in a World of Hybrids. He received an award here and there, but those never mattered much to him, except for the Career Award from the National Institutes for Health (NIH), which bought cash to free him from faculty meetings for several years. He sought work that passed the “trinity test” – intellectually interesting, with moral value, which paid the rent. He was grateful that so much of life was filled with work that met those conditions. Mike will miss his life partner of many years, who recently became his wife, Ellen Taylor, his sister, Mary, and brother, Tom, and their kids and grandkids, a few friends who endured over the years, and the birds and animals who still drop by the acre of New Mexican desert that he and Ellen called home, for food and water. Mike died peacefully in Santa Fe, New Mexico, on May 20, 2017. He would be honored by any donations in his memory to Somos Un Pueblo Unido, La Familia Medical Center, or any Santa Fe-based animal rights organization or sanctuary. Mike’s own narrative about his life helps the reader to comprehend how his birth (at the end of World War II) childhood (in Chicago and Livermore, California) high school (including an exchange visit to Austria) college (Stanford, with the opportunity to spend time in South India) and his doctoral studies at Berkeley strung together the set of formative experiences that resulted in such a man. His mercurial forays into linguistics, social science method, junkie behavior, drug policy and epidemiology, and the anthropological view displayed protean interests and insatiable curiosity. Behavioral drug researchers everywhere drew inspiration from his ethnoscientific analysis of copping in Ripping and Running. His treatment of the anthropological role in field work, The Professional Stranger, resonated with a much larger audience of anthropologists who had been in the position of the unknown other. More importantly, it communicated to non-anthropologists what the conduct of field research requires of anthropologists and other ethnographers. Luckily, we’ll be able to continue reading and re-reading Mike’s flowing prose and reconsidering his formidable insights into the things that interest us most. But from now on, we can’t look forward to new reflections and insights, such as the ones that delighted us in Dope Double Agent. We won’t be seeing him in the halls of our professional meetings, enjoying his wit or just the pleasantness of his being around. To me, he was the master of the completely different, and I’ll miss the prospect of running into Mike by chance and hearing him one more time. This entry was posted in Uncategorized on 8 July, 2017 by Shana.Harris.